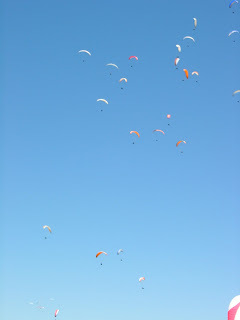 Today flying commenced in a wonderful blue sky with no clouds. The task was again a zigzag through the Piedrahita valley, not unlike yesterday. And like yesterday the conditions were challenging with initially weak lift and a lowish inversion. Nevertheless the top pilots pushed hard and started on time, after making a zero turnpoint 8 km from the start. Like yesterday the field quickly separated in several gaggles, but most gaggles seemed smaller this time. Today I did much better than the first 2 days, after 4 hours landed some 8 km short of the one-but last turnpoint. I flew the early phases very slowly and conservatively as I didn't want to be down early again. Later I got into the rhythm and could speed up quite a bit, overtaking several pilots by using convergence lines more into the valley (see track). The Finnish pilots Jouni and Kari made goal, excellent! Antti was also very close to the goal. The results will be available later.